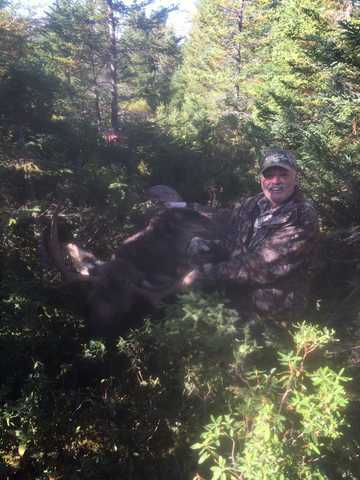 Our second Newfoundland moose hunt was successful and memorable. We first hunted with Hinterland Outfitting Ltd. in 2008. It was late September and as always the first time hunting with a new big game outfitter there is some uncertainty and apprehension. However it didn't take long to erase any uncertainty we had. Unanimously all agreed the hunt turned out to be the best big game moose hunt we had ever been on. Everything from the transportation to the hunting lodge, equipment, the cook and his food and of course the guides were all first class. I remembered thanking Craig, the owner, when I left telling him that we would certainly be coming back. Well as everyone knows time passes quickly. Each year that passed brought with it its own challenges, while we were away we lost one of our dear friends who had accompanied us on our first trip and who couldn't wait to return. But in 2015 our schedules cleared and we were once again able to return with Craig, our Newfoundland big game outfitter. While preparing for our second moose hunting trip we each relived our previous moose hunt, thinking out loud to one another wondering if this trip would be as good as our first. There would be four of us again on this big game moose hunt and we left Cleveland at 7am on Thursday October 1st in two fully loaded trucks. Thirteen hours of driving later we arrived in Lewisport, Maine. After a restful sleep at a local hotel we continued the next morning on the second leg of our journey which saw us pull into North Sydney, Nova Scotia at 8pm. Again we choose to stay at a local motel choosing a good night's sleep over being stuck in our trucks all night. The ferry departed for Newfoundland at noon on Saturday and when land came into view at 5pm we all began getting excited. We left the ferry behind us at 6:30pm and drove a short distance to a motel electing to stay the night there instead of driving in the darkness. We all awoke early the next morning and anxious to get moving we pulled out and hit the highway heading east to Bishop's Falls just after day break. It seemed as if time had stood still during our seven year absence. Memories of our first moose hunting trip came back quickly as we passed local landmarks. Five hours later we pulled into Craig's yard and we could see instantly that things were in full mode as both Craig and Alice were already preparing and packing away things required for our big game moose hunt. It seemed like we had just left and I was amazed at how good time had been to the Pomeroy's, they hadn't aged a bit! We all helped to finish loading the trucks and suburban and off we went heading to the hunting lodge. I sat in the back seat along side of the other two guys in the group who were from Tennessee. The ride was 2 ½ hours long and crossing a couple of rivers going in was an adventure in itself. But as before the old "sub" didn't miss a beat and forded the rivers with ease. Once at the end of the road we loaded all of our belongings in trailers used for this purpose and hauling them behind four wheeler's we set off on the five minute ride to the hunting lodge. Upon arriving I was glad to see the hunting lodge in the same condition as it had been seven years ago other than a new fuel building had been constructed and some routine maintenance work. It was remote, well maintained, clean and possessed all the comforts of home. After eating a great supper prepared by the "new" cook, Craig's wife Alice, as his father had been the cook the last time I was here we set about filling out our licenses for tomorrow morning. Once complete the guides decided who was going to hunt with whom and everybody introduced themselves. Both George and I already knew most of the guides but there were a couple of new faces in camp. Before the week was over I could see Craig had done an excellent job in selecting his new guides for as the week went by we could obviously see they were as good as the guides we had had on our previous hunt. The moose rut was a couple of weeks later we learned and the moose had only begun calling the week before. In 2008 we were all successful and I wondered how we would fare this year. The next morning we finished a breakfast fit for a king and "saddled up", heading out to one of Craig's favorite hunting spots. After about a 20 minute ride we parked the ATV in some alders and set out on foot using a flashlight to light the way. "I want to get in so far and sit and wait until daylight. I want to see if I can hear anything calling in the dark" Craig whispered to me. We walked for about fifteen minutes and took a seat on a fallen log. Daylight was fast approaching as we sat and listened and sure enough off in the distance the grunt of a bull moose broke the morning's silence. There you go there's our bull" Craig whispered. One thing I have to say is that once Craig is in hunting mode he seldom talk's, his mind seems to be one thing and one thing only, his prey! The only conversation is usually what is necessary. He has great patience and can sit quietly for hours without talking and very seldom moving. Craig instructed me to load my rifle and quickly added "don't make any noise when you are doing it" Yipper I thought; it's game on!! The moose seemed to be a couple of hundred yards away but from our vantage point we could only see half that. With Craig in the lead we began making our way in the direction towards where we had heard the bull moose. Fortunately Craig had a trail system cut in our hunting area, so other then grass underfoot and branches on the edges we had little to worry about for noise, or so I thought! We hadn't travelled fifty yards when Craig stopped, turned around and informed me that my brand new hunting clothes must be made out of plastic according to how much noise they made. "You are going to have to take off that coat at least, if not we won't get any closer" he said. "See that clump of trees up there on the right about a hundred yards out, the bull is right there among them, I just saw him moving"
Craig made a walking movement with his fingers indicating the moose was moving away from us and I nodded in agreement. Craig inched forward, foot by foot and I followed. With every step Craig let out a low grunt and barely touched his shoulder blade to several trees that he could reach along the trail. It wasn't much noise but it was certainly enough to get the bulls attention. Again the bull grunted and began raking its antlers, he stopped and I could hear the same low sounds Craig had been making, only this time they were coming closer and it wasn't Craig making them. "Get ready he's coming right up the trail towards us" Craig urged. I knelt down and peering ahead in the direction of the sounds I could see the outline of the bull moose through the trees; and then suddenly there he was, 30 yards away facing me, standing between two trees. All I could see was his head, chest and antlers, big antlers. My .338 was already to my shoulder but yet it took me about a minute before I placed the crosshairs low on his chest and squeezed the trigger. I still don't know what I was thinking! Instantly the moose spun 180 degrees, took several steps and stood behind a spruce tree that had limbs on it right to the ground, preventing any chance for a second shot. Suddenly I felt Craig's hand on my shoulder urging me forward. "Hurry up and get in place for another shot" he said. I quickly ran forward but as I looked ahead, my heart jumped with joy. The bull lurched sideways and fell directly into the spruce. It lay there thrashing for a minute or so and then lay still with its head and antlers caught up in branches about three feet off the ground. Craig reached out and grabbed my hand shaking it. "Way to go, good job" he said. I unloaded my rifle and knelt down by the bull. I could hardly believe it, here it was just 8:30 on Monday morning and I had what turned out to be a 40 inch 17 point bull moose already down. We wrestled the moose from amongst the tree branches and field dressed it. When we were finished we covered it using the branches we had already cut off the spruce tree in order to get the moose in a position to clean. 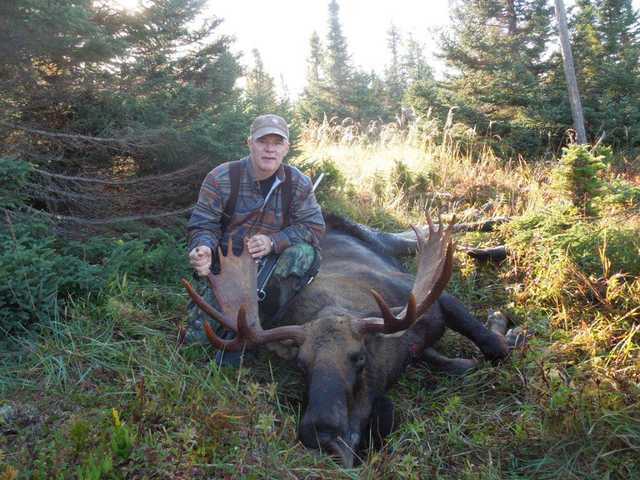 We returned to camp to learn that Jim, one of the hunters from Tennessee had also harvested a bull moose that morning. We wrestled the moose from among'st the tree branches and field dressed it. When we were finished we covered it using the branches we had already cut off the spruce tree in order to get the moose in a position to clean. 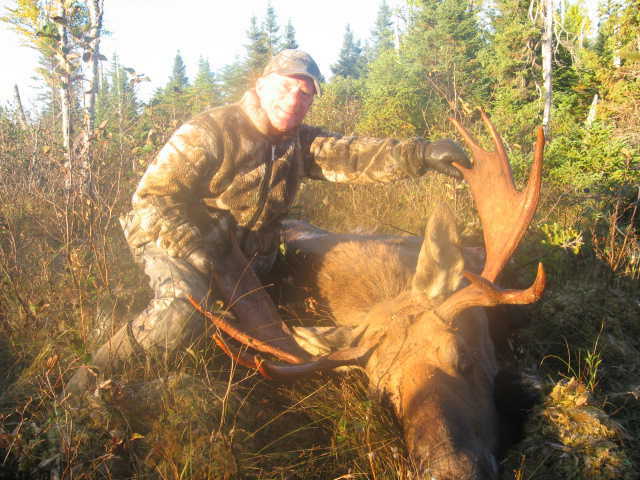 We returned to camp to learn that Jim, one of the hunters from Tennessee had also harvested a bull moose that morning. The next morning one of Craig's guides named Dexter noticed a red streak coming from an infected finger he had that was extending up his arm and almost reaching his elbow while he was out hunting. 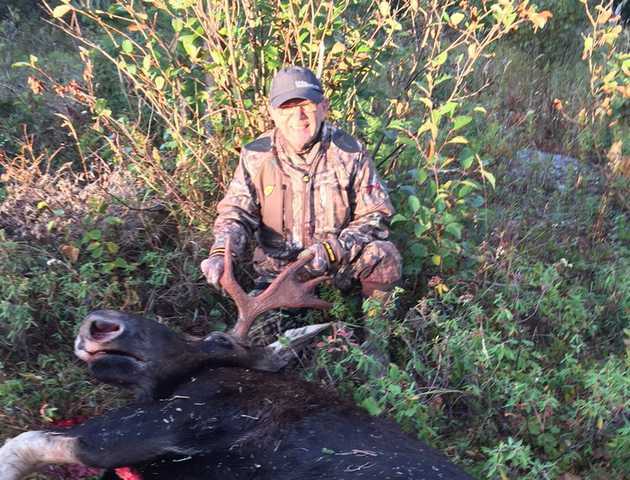 The infection occurred from a nick he had received the previous week while skinning a moose. Although he wished to finish the mornings hunt his guest advised him the proper thing to do was to return to camp and visit a hospital. The doctor agreed it was the right thing to do as he had to spend the remainder of that day and most of the next in hospital with an IV drip of penicillin. He returned to camp late on Wednesday night and resumed hunting the next morning, just another example of dedication everybody thought. Hunting slowed the next two days but while out looking for a black bear Craig and I heard a bull calling. "Come on lets have some fun" Craig said. We began approaching the bull with Craig grunting and calling with an electronic moose caller but as we neared each time the bull would retreat. However Craig persisted and after about a half of mile chase Craig finally managed to get him to step out into the open about 15 yards from us in full view. I stood taking pictures while Craig tried to entice the bull to challenge him by scraping a patch of alders that he was already scraping on. All he had was an old dry stick to use and the bull would have nothing doing with it, it would have made a great picture though! Once the bull departed we did likewise and returned to camp. "Someone should definitely go back there" I said to the guys. "He's not gone very far" Craig agreed. Sure enough guide Harold and Gary, one of my crew returned and that evening harvested the bull on a little bog about 200 yards from where we had last seen him. He measured 38 inches and had eleven antler points. Another great bull! The next day Craig again called another bull in but again we were hunting bear. It came out of the woods and stood up on a bog before it crossed in front of us about 100 yards away in plain view. On the way back to camp shortly thereafter we caught sight of a black bear but failed to get a shot at it. Had we stayed and played with the moose for another five minutes it would have walked right up the road to us. 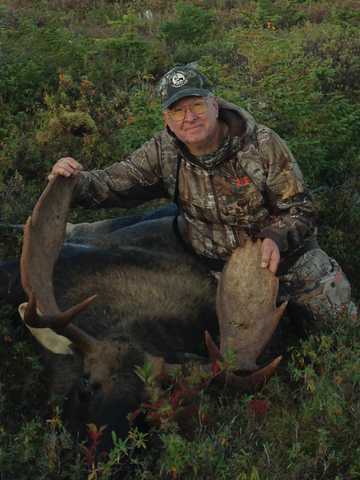 Our group's last moose was taken on Friday morning by Ralph, the other hunter from Tennessee, it was a seven point. Overall the week was awesome as agreed by all. Thursday night Craig's crew put on a little show for us complete with guitar, accordion and drum. We even had a little harmonica thrown in. We always cherished our first trip but this trip was as good as the first. Seven years ago I said I would return but I happy to say that after this trip I will be back AGAIN! Great story! Thanks for sharing, Greg!